Seeing as it's summer and all...and I'm forcing myself to blog consistently rather than go out and enjoy my summer (sigh...), I may as well fixate on what I'm missing, right? Exactly. Sounds pretty good for my mental health to me, too. Anyways. Summer = fireside. Fireside = s'mores. S'mores = Summer. And so on. I love me my summertime s'mores. And the winter ones. And fall. Spring isn't so bad, either.... But in the spirit of summer, here's a lovely roundup of delicious s'morey goodness. 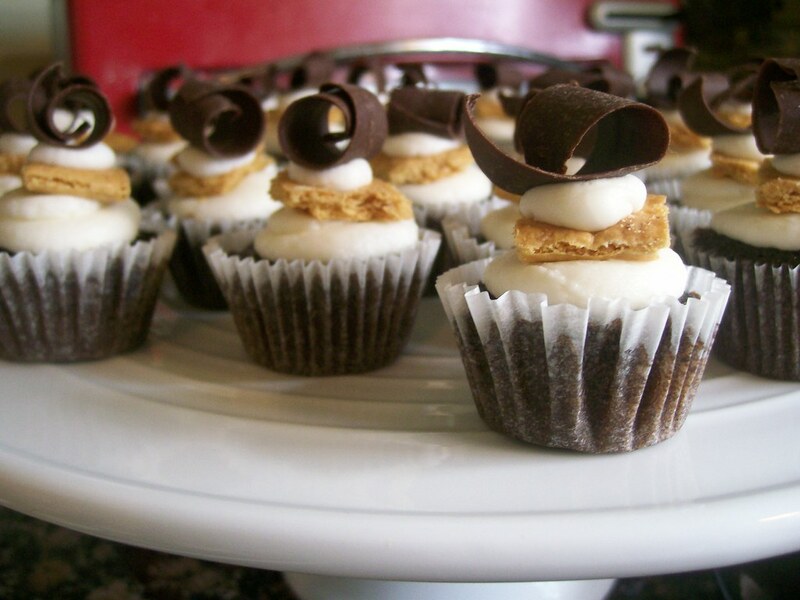 I made these S'more cupcakes by Bakerella for the Stache Stash birthday in a box I featured last week, and they were delicious. I made mine sans gooey chocolate ganache to ease my mind about spillover and meltiness, and kinda wish I hadn't. But my oh my, these babies are seriously beautiful coming out of the oven. Don't you just want to love them? The birthday boy sure did. These beauties from Angel Cakes are on my to-try list. I've developed a love affair with vegan cupcakes, and combining that affair with my s'more love just seems oh-so-right to me. The site has no recipe, but is a yummy inspiration. Dark chocolate, vanilla buttercream, and beautiful presentation to boot. It's the perfect way to let your vegan loved ones celebrate summer in a classic way. This s'more is by far the most delicious s'more I have ever seen in my life. That gooeyness is heartbreaking. And belt breaking... sigh. This presentation is pure class. I bet it could be served at a gala and nobody would even realize it was a s'more. As in childhood, camping, dirty sticky fingers and bug spray s'mores. It's deceptively classy. 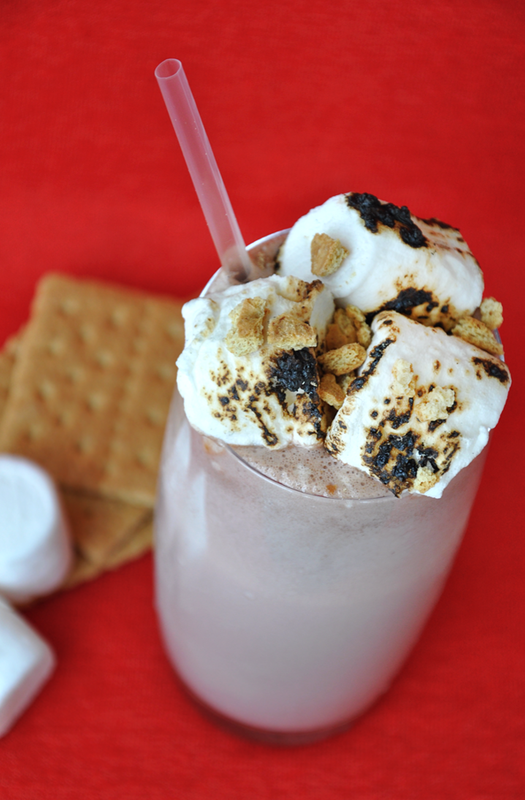 A long, long time ago, Just a Taste featured a recipe for a S'more milkshake that will change your life. If I don't get a chance to try this before the summer is over, I might die. Have I mentioned I'm swooning? I'm swooning hard. Go check out the recipe, and live your life to the fullest with this beautiful concoction. Share them with friends. Imagine the look on the faces of friends you've invited over for a casual backyard fire or bbq when they see these? Swoon, swoon, swoon. Imagine having it within your power to create a tasty, creamy, s'more flavoured ice cream all on your own. Here I swoon again. This is one of those times where I really, really wish I had an ice cream maker. The pictures absolutely kill me! The author lent a fab narrative to it, too, which is definitely worth reading. Check out the recipe. Then check out the prices of ice cream makers. Then be my best friend. Deal? Deal. Summer is the perfect time of year to jazz up the easy-to-serves, like this caramel corn done up s'more style. Imagine this served in individual popcorn baggies, or small clear cups. Invite some friends over for a movie night, then woo them with this treat. Boy oh boy do I have a sweet tooth now. Now that I've tortured you all and burned images of s'mores in your mind, why not go make them? For those of you closeby, summer isn't going to last much longer... may as well enjoy it! Host a fun summer celebration featuring a smorgasbord (hehe) of s'more related desserts and treats. Then tell me all about it so I can live vicariously through you!